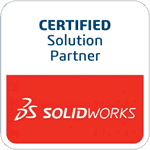 Controlling your views in SolidWorks is essential for maximum productivity. This tip will show you advanced view commands and hot keys that you may not have known were there. Instead of clicking the Zoom-to-Fit magnifying glass icon in the Heads-up View toolbar, double-click the middle mouse button or type the “F” key. Hold the “Shift” key and the middle mouse button down. Then move the mouse up or down while still holding the middle mouse button to smoothly zoom in. An alternate way to zoom in and out is with the “Z” key. Tap the “Z” key to incrementally zoom out. Hold the “Shift” key and tap the “Z” key to incrementally zoom in. Type the “G” key to open the magnifying glass. You can zoom into a specific area and perform normal tasks like selecting or dimensioning inside the zoomed-in area. To exit out of the magnifying glass view, retype the “G” key, type “ESC”, or click in the graphics area. Instead of rotating with the middle mouse button, rotate around a part using the arrow keys. Also, hold the “Shift” key and use the arrow keys to rotate in 90-degree increments. Use the left and right arrow keys while holding the “Alt” key to rotate clockwise and counter-clockwise. Holding the “Ctrl” key and using the arrows will allow you to pan around the part. The “Ctrl” key and numbers 1-8 are hot keys for SolidWorks view commands.